Summary: Vika and Nikolai are two enchanters living in Imperial Russia. Vika is a powerhouse who can wield fire, ice, and other natural elements to her liking, while Nikolai is good with mechanics and building things with his magic. As is the custom in this fantasy world, only one of them can be the Imperial Enchanter (working for the tsar), so they must compete in the Crown's Game - one of them will win, and the other will die. 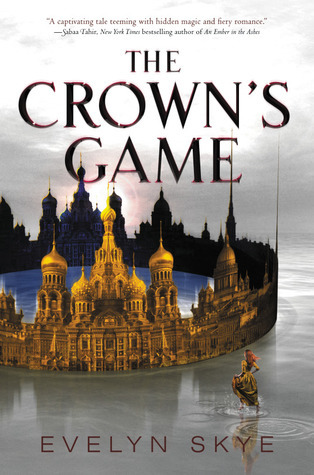 However things are complicated by the fact that they are inexplicably drawn to each other, despite the fact that they are competing to the death, and things get even more messy as Pasha - the Crown Prince - starts falling in love with Vika as well. Thoughts: In all honesty, I was drawn to this book because the premise sounded VERY similar to Erin Morgenstern's The Night Circus, which is one of my faaaaaaaaaaaaaaaaavorite books: two magic wielders who are forced to compete against each other to the death, while also falling in love. It doesn't have the same sort of rich, descriptive imagery that Night Circus is so known for, but it was still a really good book, and it was over before I was ready for it. In general, I felt like Nikolai was a more compelling character than Vika, just because of his background and how his birth and social status eventually affect the story. Vika is a badass, but she's kind of always a badass, so while I liked her as a character, I didn't see the same sort of arc for her that I saw for Nikolai. I found the competition fascinating, much more fascinating than the (insta-)love story, which I thought happened too suddenly. I honestly didn't know how it was going to end, though I had my suspicions. And I loved how thorough Skye is about depicting Imperial Russia -apparently this was her major in college, which is pretty cool. It's not a world I read about much, so I was happy to check out something new. As I said, it was over before I was ready for it to be over, and I'm glad that there's going to be another book. I can't wait to see where it goes!